Inside: The weekly food budget that saved our family so much money that we were able to live on one income. Updated January 2018 — Originally published in 2015, this post detailing our family’s easy weekly food budget is still our #1 most visited blog post of all time! Updated with new tips and resources for 2018. As a member of mommy support groups, I frequently see the question posed: how can I afford to be a stay at home mom? I’ve been a working mom, so I get it that some of us crave “adult time” and enjoy career accomplishments. But I also know what a crappy feeling it is to leave your kids in the care of someone else all day. Ultimately, I made the choice to leave the corporate world, and I wanted to share the one lifestyle change that made it possible. Note: This post contains affiliate links to the products and apps that helped make our weekly food budget successful, so you can try them too. Read our disclosure policy here. This past November, I quit my job. The plan was for me to enjoy the holidays with my family and start the search for a better employer in the new year. I did that, and things went so wonderfully that my husband and I decided it would be best for our famil (and my health) if I stayed home indefinitely. There was just one problem— we cut our income in half. While I was working, I always stressed about money. Even with two solid paychecks, it never felt like enough. How would we be able to make it on just my husband’s income? Aside from monthly non-negotiables (housing, utilities, insurance), there was one expense that dwarfed them all. Once we seriously reevaluated our spending in this area, it freed up a huge chunk of our budget. My husband has always loved to cook, and did so on a regular basis. However, we never planned out meals for the week. As a result, we were forced to pop in to the grocery store on multiple occasions throughout the week for whatever he decided to fix on a whim, or pick up take-out when we were short on time. It seems hard to believe that food could have such an impact on the budget, so to prove it, I’ll show you what we used to spend. $240 – We made at least 3 grocery trips every week, spending about $80 each time. Going to the grocery store without a list means you’re likely to forget items and end up having to return later. Multiple visits make it easier to succumb to impulse buys, as you are tempted over and over. $160 – We ordered take-out about four times a week. Whether for lunch or dinner, with tax and tip it’s about $40 for our family. $50 – While working, I spent about $10 per day on lunch. $50 – Hubby also would order out food at work. Add that up and you get $500 in one week! That’s $2000 every month — insane! This doesn’t even take into account any occasions where we would go out to eat in a restaurant. It was money we spent without even thinking — we had to eat, right? It was actually my husband’s idea to start weekly meal planning. Amazingly, a commitment to this one concept was the key to a budget that worked. On Sunday evenings, my husband and I sit down and talk about what we’d like to eat for dinner each night. To make it easier, we’ve designated days such as “Salmon Mondays,” so all we have to decide is sauce and sides. Other days, my husband might have a new recipe he wants to sample. When the week’s menu is determined, we make the grocery list so we know exactly what needs to be bought. No more inefficient daily trips to the store. We figure everything out in advance, which allows us to grocery shop once a week. Impulse buys are a thing of the past. We go in with a plan and don’t end up buying things that aren’t on our list. Bye-bye-expensive restaurant meals. Since we’ve got a meal planned for each night of the week, we don’t need to order take-out because we’re hungry and unprepared. Lunch is no longer a separate expense. My husband cooks for an army, so there are always plenty of leftovers for lunch. TIP: Make sure you are stocked up on reusable food storage containers! We got this Pyrex Storage Set as a wedding gift and we use these containers every single day! $150-200: One grocery shopping trip for the ingredients needed for dinner every night of the week. That’s it. We’ve gone from spending $2000 a month on food to no more than $600 (Updated 7/15). It’s an incredible change and all it took was setting aside 30 minutes on Sunday night to create a meal plan. If you think about all the time saved by consolidating grocery trips, it might actually be less time to meal plan than to try to go through the week without one. An added bonus is that when you cook your own dinners, you know exactly what you’re getting — it’s healthier! (This helped me with my weight loss after baby). Even if you don’t aspire to be a stay at home mom, you could put up to an extra thousand dollars in the bank every month. That’s a weekend vacation! If you take a realistic look at what you’re spending on food, you might find that you don’t want to “eat up” a large portion your income any more. Money-saving apps to get cash back on groceries — My absolute favorite is Ibotta — I save more with their rebates than I do with coupons and I get the cash back right away! Plus you get $10 just for signing up!) Click here to sign up for Ibotta through my special link and claim your $10 welcome bonus! 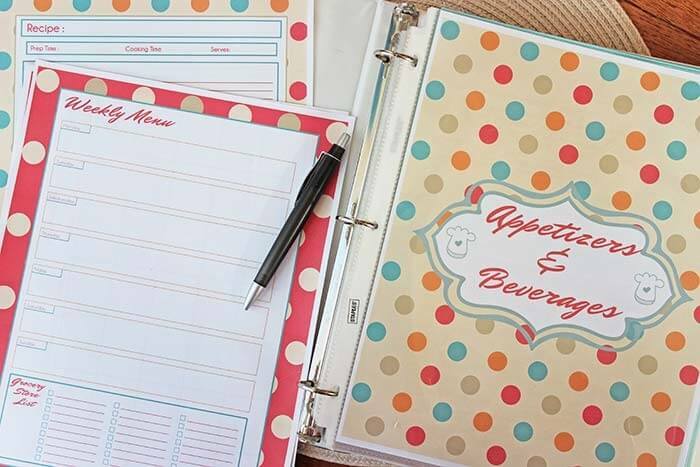 Printable Recipe Binder & Meal Planning Organizer — This awesome bundle includes everything you need to organize your recipes & prepare your meal plans. You’ll get undated monthly calendars that you can print again and again, recipe cards, dividers, shopping lists, and more…and it’s only $3! Click here to grab one and make meal planning a breeze. Vacuum sealer for maximum freshness and even more savings! 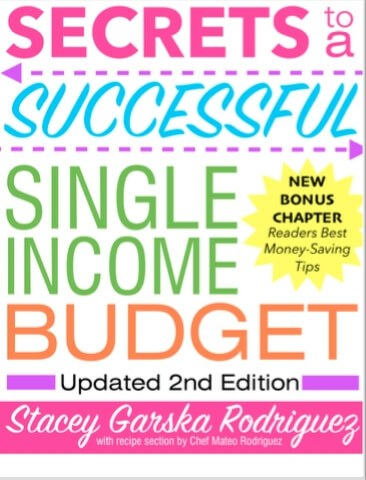 I spill ALL my money-saving secrets in my new ebook Secrets to a Successful Single Income Budget: our step-by-step guide to start meal planning (it’s easier than you’d think!) plus all of the extra “little” tricks I’ve learned along the way to save BIG money! This really has changed our lives and I’m so excited to share it all with you! There’s no reason you can’t start saving money right away too! Follow Stacey @ The Soccer Mom Blog’s board Positive Parenting Tips on Pinterest. Wow that’s awesome! I should take a look at this too especially now that I’m getting back to my healthy eating habits. I’m already a huge comparison shopper (and I love that walmart had the price comparison thing on their app that gives you $ back if they find something cheaper elsewhere – called savings catcher). I think with coupons I could save even more! Thank goodness for warmer weather. We like to grill out a lot and usually make enough for days! Thanks– I was a little nervous people would call me crazy for even spending that much in the first place! I’m usually very frugal, but for some reason I didn’t pay attention to our food bills. Oooh yes grilling season– can’t wait!! Well, it is completely nuts, and I should know. I’m crazy. (Post partum psychosis x 2 and depression with S.A.D.!). Of course, I also put a ton of groceries and meals out on credit cards while I was essentially homeless back in the early ’00’s so I know that food is one of those sneaky expenses. You’re right Kristy, food can definitely be a sneaky expense! Great post! It’s amazing how much food a family goes through, but with careful planning like yours the cost savings is substantial. Thanks for the positive feedback! I’m glad we got in the habit of smart shopping when they’re young to be ready for when they’re older. I ate SO much when I played soccer in high school! Thanks Leah! I’ve heard of Ibotta but haven’t looked into it closely yet– but I’ll definitely do that today. Every little bit adds up! The ibotta cash out is $20.00. I don’t coupon much. I found that I’d buy things not normally on my list, and spend more. So, I only clip coupons for items I already use, or if I occasionally want to try a new product. The downside to food coupons is most of those items are highly processed, prepackaged foods, which are neither healthy, nor cost conscious (of course I buy some of those items, I’m not a purist). However, I DO shop the ads. For example, last week my favorite store had a 10 for $10 sale (mix and match, you didn’t have to buy 10 of the same things). Staple items that were on my list, I stocked up on. This upcoming week, they’re having a buy 2 get 3 free sale – and many of the items are meat, poultry, and other items that can be frozen and preserved. One other tip that I advise is: invest in a FoodSaver vacuum-seal machine. They cost about $80. This allows you to buy the family and bulk sized items, package into recipe sized portions and not worry about waste from freezer burn. It works great on produce and block cheese too, extending their shelf life dramatically. It’ll pay for itself in less than a month for an average family, especially if you find yourself throwing out untouched left-overs often. doing a better job of preserving the food that I do purchase. I also don’t have to pre-plan the meals so diligently now, because with my well stocked freezer and pantry, I nearly always have the items on hand, so, deciding on the family dinner is more like eating out – “what do we feel like having tonight?”, rather than ‘it’s spaghetti Wednesday”. Its nice that you shared your experience to help people dont get me wrong, but I don’t feel it applies to me or in fact most of the people I know. The amount you formerly spent on food exceeds our monthly income. We live off $1,900 each month. The sentence about having an extra $1000 per month to put away for a vacation or something kind of grinds my gears. Stacey- I just wanted to say I appreciate your honesty and sharing how you saved so much money…we probably also spend at least $2,000/month on food, and it’s refreshing to hear someone in a similar situation come up with a creative idea. I think alot of my friends are in a similar situation as you as well. Everyone is in a different place and I feel like your story was more of an example of what you can do! Thanks so much! I have to agree we live off that amount monthly We only have 200$ to live off a month for food. To save that much on food, glad it worked for you. If we had that much to just throw at food a month. I still dont think I could do it. How could you not tell. Hi Kat- I understand that not everyone will relate to my experience. We live in one of the biggest cities in the country and everything is SO much more expensive here than the small town where I grew up. When you don’t have a set food budget and aren’t paying close attention to what you’re spending, it can add up very quickly. Thanks for reading and sharing your thoughts! This is so incredible once you total it up! Any chance you could elaborate on other Salmon Mondays and other go-to days? I feel like I barely have 10 meals that I can cook easily and then it’d get repetitive quickly. I wish I had a take home pay of $500. I’m amazed that much money can be lost so easily. Hi Lorraine, thanks for reading! It definitely was very eye-opening how much money we were spending without even knowing it. I have been tracking how much I spend on lunch each day at work and it is crazy to see that I too spend on average $10 a day! Way too much! It is something you don’t even think about! Absolutely! Individual lunches don’t seem very expensive on their own, but buying lunch every day can cost a couple hundred bucks a month–yikes! Bringing leftovers from the night before cut that expense out completely, and it’s healthier because you know exactly what you’re eating. I recently stopped working and went back to being a stay at home momma as well. I try my hardest to meal plan before I go food shopping but doing so while chasing around a 2 year old is hard. My new goal is to do this on Sunday night as well, with my husband after the baby goes to sleep. I’ve been wanting to create a recipe book as well. This seems like a good time to do so. Seeing those amounts made me realize I’m doing the exact same thing. 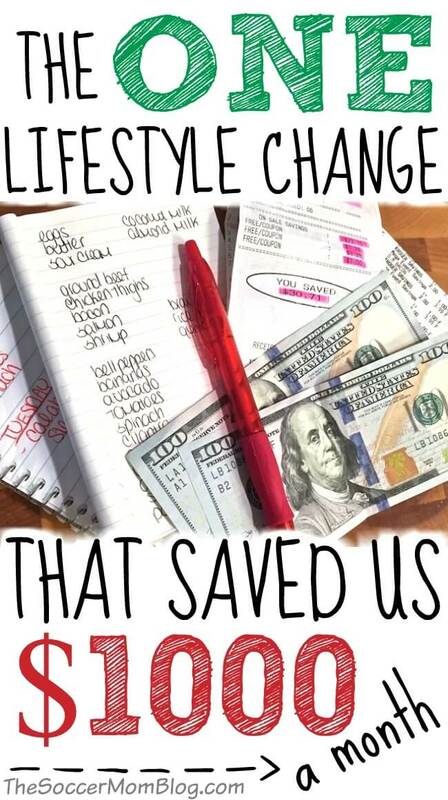 Once you start meal planning and see the money you can save, you’ll never look back! It’s addicting to check the weekly sales, couponing sites, and apps to see how much I can lower our shopping totals– I’m slowly getting better at it 🙂 Check out my posts on our “Couponing Experiment” for more ideas! Thank you for reading! Is there a way to convince people to do this? I keep trying to mention it to my parents (who blow through about $250+ a week on groceries) but they act like it’s the stupidest idea. That, or they don’t think a 19 year old knows anything about saving. Perhaps ask if they will let you help them try this for one week. The results might be enough to convince them it’s worth it! Once we saw how much money we could save, there’s no way we could go back to our previous spending habits. I love this post! I recently quit my career of 10 years to stay at home. It’s amazing how much money I spent on coffee, work lunches, and dining out for dinner time because I didn’t plan ahead. I have a $500 monthly budget for family of 6. first thing I do every time I shop is to hit the clearance section, discounted produce, and manager discounted meats (they are marked with yellow stickers–I call them my happy stickers!). I also hit BIG LOTS and find even organic foods for below clearance prices. I stock up this way and am able to stretch our budget and feel good knowing I am feeding my family quality food. Most meals are homemade. I am blessed to be able to do that. I know it’s been a couple months since you posted, C, but I have to say thank you! What great ideas. I too have a family of 6, and a $500/mo. grocery budget. Your tips are a godsend! Thanks for a helpful article, Stacey. Happy New Year! So glad you found some great ideas here Sarah! Happy New Year to you too! I found this on Pinterest. I am a lot older, and it’s been a while since I was feeding small children at home. I congratulate you on taking control of your budget. A lot of people never bother to even check what they are spending at the supermarket. In time, this will be so natural you’ll have all the prices, ingredients and menus in your head; you won’t need Moleskine notebooks (hint: they are incredibly expensive — get a generic notebook). $500 sounds a little low for 4 people, but I assume your children are very small. As they grow, you will have to increase this. By the teen years, you will have to buy adult sized (or bigger!) portions for them. I suggest you start NOW, figuring out what you spend per adult and per child. It will be a good guide. Most folks have already given you the good advice: shop sales. Shop mark-downs and near-expiration date items. They are fine if you freeze or use immediately. Every store has this, you need to learn where they put this stuff and what days they mark down on (often a Monday, or after a holiday). Use a coupon on a markdown and you really save. I was pretty startled you both ate lunches out every single day, at $10 a pop. $100 a week? I would have freaked out about that long before having kids! Pack a salad or sandwich, and you can cut that by 75%. It’s also healthier. $2000 a month for groceries, for 2 adults and 2 kids is literally the most I have EVER heard of ANYONE spending. I’m glad you got this under control. It’s well worth it. The only drawback: you are saving about $1500 a month, or $18,000 a year. That’s fantastic. But unless your job was “Walmart greeter”, it isn’t enough to make up for staying home. (I mean financially; it has a value for your children far beyond dollars & cents.) But you seem so creative and willing to work hard at savings, I am sure you’ll find a myriad of other ways to save big! Good luck! Hi Lola! Thank you so much for reading and for your insight. I definitely have received feedback from some that were shocked by our spending, but I wanted to be honest to show that it doesn’t matter what your past habits were, you can always make positive changes! All of my figures are estimates, so there might have been some days where I spent $7 instead of $10 on lunch, or the occasional day I brought leftovers (before I made that my habit), but it is easier to round up and keep the numbers even– but you get the idea. I’m willing to bet that there are many other working moms (and dads) who don’t think anything of spending a few bucks here and there for lunch or coffee, because it seems like such a minor expense, but if you do it every day it does add up! As a management-level professional, I definitely was making more than minimum wage, and you’re right, meal planning alone wouldn’t cover my salary. However, this was the catalyst to evaluate ALL of our spending habits. Also, when I’m home most of the time, I’m not buying gas, going out for happy hour after work, buying pricey work clothes, or paying for a housekeeper. With me home our expenses went down a lot too. (I’m finishing up an ebook which will detail everything we’ve done to make our this lifestyle work for us, as well as a typical week’s menu). Thanks again for reading and for sharing your thoughts! I always appreciate feedback! Don’t forget that if you were to add up your other savings (no more corporate clothes/shoes, dry cleaning, work travel expenses and vehicle wear and tear, etc. ), that, added to your lower grocery costs, brings your salary “coverage” total quite a bit higher than that commensurate with a former job as a Walmart Greeter. While it is certainly true that not every family has the choice to designate a stay-at-home parent, when both salaries combined are truly needed to cover living costs (even with careful budgeting already), but it sounds like your husband’s salary is able to cover more than half, so it becomes do-able for your family with careful tracking and belt-tightening. The point you make so well is that most of us can look to our food budgets to be able to cut the fat in more ways than dietary. I hope you are still socking away emergency and retirement savings, however – as your family learns to further tighten its belt. For another reason, I deferred those expenses much longer than was prudent, and am paying for it now. Don’t make my mistake. You are most welcome. You deserve applause for bravery and sharing, NOT criticism because your experience didn’t directly relate to everyone else’s. Thanks for responding to my savings comments. I did NOT have great financial mentors, so I made a lot of mistakes which follow me to this day (they were great money *managers,* but they didn’t think it was any of my business, as a kid, how they did it – and that set the tone for life). I’ll admit I was a bit worried that maybe I would come across more like know-it-all than someone who was simply trying to be helpful. Thank you for your honesty! It’s refreshing! I see a lot of “we only spend $200/month on groceries” and I feel too awful to proceed and in return, don’t get the advice! To be honest, I cut ours down from $1,500-$2,00/month for the four of us (we’re GF and half DF and one severe nut allergy) we eat all organic and no refined sugar. With planning, and just not turning into the fast food parking lot, we have cut it down to $1,200/month, sometimes $1,000. Because of the restrictions diet wise, I usually shut my mouth and run when I hear moms comiserate about their grocery bills. Thank you for not making me feel bad about that number!! I can tell a difference with cutting down on going out and a little planning, we even FEEL better. Now, our cheat is to run out and buy frozen pizzas instead of ordering. The one thing that really helps was Costco. We chose them because they treat their employees well and give benefits to them. If they have a dry good or non-perishable on sale, I’ll stock up. I’ve crunched the numbers and bulk is the way to go. I know you don’t coupon, neither do I, but walking into Anywhere with RetailMeNot ROCKS. Cartwheel by Target is also fabulous. Usually the signs don’t match the fine print on the Cartwheel app (you end up saving MORE). I just started meal planning to stay within our $300/month grocery budget. I only eat out twice month at work and I’ve now began to make meals on saturday to eliminate eating out on the weekends. I’ve started to see the difference in our budget and think it will be something that we stick with. I think it’s time for me to do a hard reset on how I buy food. We have five kids, and buying for seven people – well, I wont tell you what we spent every month. My oldest daughter got married last month, one of the boys moved into a place near campus, another daughter is looking for a place right now – and another son will likely try to piggyback her (if she lets him) so he can live closer to campus/away from parents. That would leave three of us instead of seven. I don’t even know how to start. Hi Velezita! Start with baby steps if that’s what is easiest. Look for one way each week that you can make a change in your habits. If you usually go out to eat on on the weekends, try cooking in one day instead. The weekly sale ad at your grocery store will also let you know what is the best deal and you can save big that way too. I’m actually working on my ebook which will tell exactly what we did step-by-step from the beginning to where we are now. Don’t be embarrassed by what you spend– just make a commitment to shop a little bit smarter 🙂 Everyone has to start somewhere! I love the idea of meal planning. The hard part is my husband…he says he’ll never know what he’s in the mood for until the day of. drives me crazy to go to the grocery store every day. I am a about to quit my job and going to try to build my clientele as a stylist so I can have more time with my daughter. Your story sounded like mine and I am so scared quit, but for my mental health and for the sake of my only daughter, she deserves to have a mamma that can be present. I am reevaluating our money on spending with food. We also love FOOD! And my husband and a wonderful cook, but i know we spend a lot when it comes to food. Thank you for sharing you have really gave a me a better outlook on my decision! I totally agree! Meal planning is so awesome. Since I have started I have never regretted it. It makes meal time less stressful more prepared and usually much tasty less thrown together meals. Absolutely! It seemed like it would be a lot of work at first, but it is so much easier in the long run. Thanks for reading and for sharing Grace! It is incredible the impact food and groceries can have on the budget. My partner and I eat the same meals all the time and have cut our budget significantly and are eating so much better. So true! Having favorite meals takes a lot of the planning out and lets you buy in bulk, so you save time and money. Hi CC, thanks for taking the time to read and share your thoughts! I’ve definitely heard from some that our previous spending was shocking to them (and it was shocking to me too when I put it all on paper!) Having a family makes a difference, but where you live can also have a big impact on prices for eating out as well as groceries. I came from a small town and I was amazed by how much more expensive was when I moved to a big city! That being said, if you’re already on top of your food spending then that’s awesome! You are so right. When you are working outside of the home the number you have in your head is how much you make per hour but when you realize it takes money to work. When you factor expenses you realize half of that wage is expenses, gas, work clothes, lunches, lattes, gifts for co workers, etc. you realize wow is it really worth $6 an hour for all the stress and to miss my kids every moment? I had to make some life changes when my older son was diagnosed with Autism and I was near a nervous breakdown. Stresses to the max, having migraines and my youngest got really sick and had to be hospitalized for five days. Enough was enough. I had to quit my job and work at home fill time. I didn’t know how I was going to do it but it all worked out. I now blog about my journey about creating multiple sources of income at home. Love your blog btw!! Thank you for sharing Sandi! It sounds like you made the best choice for you and your family and I’m so glad it has worked out for you! Hi! New reader! Love your blog! We also used to spend so much on food and miscellaneous items. We added up our expenses last October and spent a whopping $2100 on just “stuff” (including food and gas). We’ve since been able to take that down to $1200, saving us $900 per month!! It’s really eye-opening to take a look at what you’re spending and is something I recommend everyone do! Hi Sarah! It is crazy how much this “stuff” adds up! It is definitely a good idea to evaluate all of your spending, little things that you don’t always account for otherwise. Thanks for stopping by and sharing! Wow, this is so inspiring! You all saved some serious money with some hard work and planning and I think that is awesome. Thanks for putting yourself out there to help other be encouraged- I know how vulnerable that can feel. I knew meal planning was a huge money saver, but I admit, I didn’t realize that it would equal such huge savings. I think your experience makes it pretty clear that having a plan is so important. 0K you Soccer Moms: call your own Mom and Grandmom who think they don’t need to plan because they are feeding only themselves! I need to plan my meals ahead of time because I am eating out too much and that is very expensive and not healthy. I had bariatric surgery 6 years ago and have gained back some weight and I have to avoid green veggies because of tendency for blood to clot. So I have to eat protein first and use vitamins for the veggies. The comments have challenged me to plan my three meals a day AND my snacks. I challenge other Senior Citizens to do the same and save their money for a trip or the grandkids education or any number of things or experiences that you have always wanted. That is such an excellent point Marjorie — thank you for sharing! My own mom had actually mentioned the same thing to me. She started a blog not too long ago (http://mythinkbiglife.com) and is mulling over the idea of creating a meal planning post for single adults. I’ll be sure to let her know that there are others out there who would love this! One grocery suggestion to get through the store faster– I made a grocery list template in excel with sections of the store listed in the order of a store walk through — produce, bakery, meats, etc, however your regular store is laid out. I print out a bunch on the backs of scrap paper from work. This saves a lot of back and forth in the store and scanning up and down the list. Everyone in my house puts things on the list and we get through the store in ten minutes. Plus, you can make the produce section with many lines and the cereal section with just a line or two to encourage a more balanced, healthy list. It’s so true! We started using cash envelopes to budget. $200 a month goes in my food envelope. I also put $80 in a miscellaneous envelope for unexpected expenses. Sometimes we have to pull from that, but usually we stay under $200 a month for my family of 6. I can’t imagine spending $2000 a month on food! We’d be homeless! The envelope system is such a good idea! I use cash when I go places like Target, so I won’t overspend lol. If I can’t pay for it with the cash I brought then it goes back on the shelf! Hi Kristine, thanks for reading! I can only write from my personal experiences; hopefully like you said it can encourage people to take a closer look at their own budget. Our family lives in a large city, and things are much more expensive here than the small town where I grew up. I think where you live can play a role in how much things cost too. One thing I do because a lot of time, I’m too busy to meal plan is make up a list of 20 meals for summer (with recipes) and 20 meals for winter (also with recipes.) Then when I’m just to busy to sit down and think up stuff to eat, it’s all ready for me and I just make a list and go to the grocery store. I only use family favorites to make up the lists and it’s worked out just fine. If I see a recipe I want to try, I’ll add it in but if I don’t, it’s done anyway. That’s an awesome idea Rebecca! Once you do the initial work making the list, it would be so easy the next time around to just grab a recipe and go! Great job, I also am a mother of 2, and your story sounds just like mine and my husbands! So relieved to know were not alone! Thank you for sharing your story. Its inspired me to try this as we’ve discussed many many times about me being a stay at home mom. Your success has made it seem more possible then we have ever thought…thanks again! Hi Whitney, I’m so glad to hear you could relate to our story! Once you get started and see how much money you can save, you won’t ever go back 🙂 Thanks for reading and good luck! Keep me posted! Fantastic! I literally just quit my job November 5th (2015) to concentrate on my writing full time. This is a great article; so well written, hugely informative and just what I’m looking to do. Thanks! I can’t wait to dive into your other tips! I’m so excited for you Nanette! Quitting a job is terrifying, but for me it was one of the best decisions I ever made. Im enjoying your blog, but I have a question….since most of you are stay at home Moms, do any of you ladies have a garden? I grew up on a ranch, and my Mom always had a huge garden. We always had fresh veggies & fruit, and did tons of home canning. I was a single Mom, and my garden & home canning was my money in the bank. I work in heavy construction trade, and some work years are better than others. Its a great feeling when you’re unemployed to see all the jars of goodness in the pantry! My hubby doesn’t even make $2,000/month and I am a stay-at-home mom. That is great that your family has found a budget that works! I really must start doing the meal planning in advance for the week, didn’t realise it could make such a difference but it makes so much sense. Must also make sure I make a list and don’t miss anything out so I don’t need to go back to the shop! It really does make such a difference! You’ll be so glad you made a list 🙂 Realizing you forgot something important is a bummer! Great suggestions! I think this approach is also much less stressful! So nice to know what is planned for dinner. Hi Stacey. I think your suggestions for reigning in your food spending is great. As you say, you can only do it from a personal viewpoint. I’ve taken the time to read all the comments posted and, like you, see something valuable in each one. I just wanted to let you know that your suggestions reach further than the borders of the US, Here in Australia, we don’t have coupons or any of the apps for stores like Target etc. We have 3 major supermarkets, who have stores all over the country and then in each state there may be 2 or 3 other players who try to outdo the big guys. In the last couple of years, Aldi has made a big impact here, with their cheaper prices, and i must confess, that I shop here for all my staples. My daughter now finds herself in a similar financial situation as yourself, although she doesn’t need to become a SAHM. Two of her children have osteogenesis imperfecta (brittle bones) as does her husband. So from week to week she has no idea if she’s going to be spending some time in the hospital or buying special medication. Then she feels guilty because she feels that the other two healthy children might feel as if their brothers are getting more attention than them, so she compensates by giving them treats. I have recently been encouraging her to sit down and make a meal plan just so that they don’t eat so much take away each week, the cost of which sends me into a lather, She has started to do that and she hopes to be able to continue it. With our school year about to start, she also has the added expense of the children’s uniforms and books, so she has an added incentive. I realise that all countries are different, but have found that food prices in Australia have almost spiralled out of control. We can buy a loaf of bread for 85 cents Australian, but if we want a small piece of rump steak, we are paying between $20 and $30AUS depending on where you live. Here it is much more expensive to live in a small town than it is in the city, unless they have a major supermarket somewhere close by. Oh my, I didn’t realise I had prattled on so much. I just wanted to give you a view point from another country but also to encourage you to continue with all your helpful hints as they help people all over the world. Than you. Hi Denise, thank you so much for taking the time to leave such a thoughtful comment. It IS very encouraging to know that you found this post useful, and I find it interesting to get the perspective from another country. I can’t imagine how difficult it must be for your daughter and her family to have frequent hospital stays, and I can see how the convenience of take-out would seem easier at times. Perhaps on weeks like that it would be possible to make a crock-pot meal? It takes just a few minutes to toss in the ingredients and then it cooks on its own and will be available for anyone who is home. Thank you again for sharing your thoughts and for reading the blog! My family and I just did the same. I left my full time job (again!) finally realizing it was grocery budget that needed attention. I think we knew, but when you don’t have the time to really look at it and do something about it, it is hard to fix. Grocery store trip here, takeout there……it’s a never ending cycle! It’s crazy to think THAT’S why so many mom’s feel they can’t be home! Love that you and your husband meal plan together! You have found such an easy way to save money! Thanks for sharing. I feel like you just described my life. I too quit my corporate job in Nov. and food was the biggest expense and it’s the one that always gets us at the end of the day. Great job slimming down on spending! I would LOVE to be a stay at home mom. It hurts to have to leave my boys 5 days a week, but I’m divorced and receive ZERO help from their deadbeat father so no choice. If I had a good, caring significant other who worked and brought home money to the family you better believe I would make it work. We are able to live on my one income so we would be living on his one income so they could have their mom. If you have a good spouse you should do this and be with your kids. You have a blessing many of us single parents would be unbelievably grateful for! Hi Christy, I do realize that it might not be possible for all parents to stay home at this point in their lives, and I hope you can tell I didn’t write this post insensitive to that. I know how hard it is to leave your babies and go to work, as I have done this too. Your children are blessed to have a mama who works hard and makes sacrifices for them! They do see that and they will know (especially as they get older) how much you love them and do for them. I have started saving money. Every month I will make a budget to save at least some money. Thanks for sharing. My husband and I are in the same funk you started out in. We go to the grocery store at least two or three times a week. I can’t wait to try out your Printable Recipe Binder & Meal Planning Organizer! Thank you for the great content! Efficient meal planning and shopping really does make a huge difference. 🙂 Hope the binder helps! Great post! Food prices vary as do incomes people. Just take the advice and run with it. My husband also cooked for our family for over 35 years as I worked full time while raising 3, now adult daughters. I shudder to think of the money he spent. We were spending about $1000 a month and that was back in the 80s and 90s!! My husband meal planned and shopped and went around the grocery store twice; once to get what was on the list and the second time to look for what he called himself “impulse purchases” to try. Of course I did not know that for many, many years! We ate very well and still do. It’s just the two of us now and I retired very early at 58 due to chronic pain. Our income was cut in a third, but I had the health insurance, which is ridiculous! We finally went to a religious based medi-share plan. That cut our medical insurance by $1400 a month!! We also switched to a Christian health share this year. I wish I’d done it last year when we had our 3rd daughter – my friend on the plan also had a baby and almost everything was covered. We’re still fighting with our previous insurer.